The Story of Motown, New and Revised - The Story of Motown New and Revised, by Peter Benjaminson, released in November by Rare Bird Books, has just been featured on NYC TV. 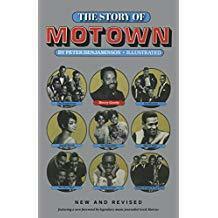 The Story of Motown New and Revised, by Peter Benjaminson, released in November by Rare Bird Books, has just been featured on NYC TV. Former Newsday columnist and CUNY-TV Host Sheryl McCarthy interviews Peter Benjaminson about his recently released book "The Story of Motown" and the effect Motown has had on America. Click on "The Host" headline immediately above to view the video. Released in honor of Black History Month, this entertaining video describes The Story of Motown new and revised edition. Click on the Story of Motown Video headline above to access this video. The first book ever published in America about the Motown Record Corporation, this new edition of The Story of Motown includes a foreword by legendary rock critic Greil Marcus. It's being released in conjunction with the Motown Record Corporation's 60th, yes, 60th, Anniversary and in celebration of the fact that its author has written more books about Motown than anyone else on earth. REVIEWERS LOVE 'THE STORY OF MOTOWN"
"Takes a clear yet affectionate look at one of the major musical institutions in this country. He presents Motown's faults without flinching and acknowledges the company's and Gordy's accomplishments… a great Christmas gift for music fans." "…Invaluable as a capsulization of the spirit of the single greatest force in the growth and spreading of black talent. Benjaminson holds back nothing, sharing with the reader the thoughts and moods of the various figures who came and went during the early years. He reflects both their enthusiasm and their disillusionment, their talents and their failings, their beginnings and their fates fulfilled." "…goes a long way in documenting and explaining the inherent racism in the music business―even showing how Gordy used it to his advantage in forging the immortal Motown Sound, the 'Sound of Young America.'" "…a well-researched and very enjoyable look at our own Motown records." "A very interesting story of a phase of modern music that had a bearing on lives both white and black." "…a cohesive history of how Berry Gordy's vision of assembly-line recording evolved into a major cultural force." Now available in paperback, Kindle, and audio formats on Amazon.com.